My friend Leigh Ann does a post on her blog called Friday Obsessions, in which she posts several different things she's been obsessed with for the week. I'm not going to do that. Mostly because, well, after reading about Leigh Ann's multi-faceted obsessions...I realize that I am actually kinda boring. I think if I tried to do this every week, I'd just link to the previous week's post and be like- "Yeah, remember that? Still on that. Thanks." But TODAY I do feel like sharing some of the things that I'm obsessed with lately! And, specifically, this video. Note- I've never thought much of Justin Beiber. A 15-yr-old boy gyrating on stage and grabbing his crotch just creeps me out. BUT I adore Selena Gomez....and when they started dating I had to at least admit he must be okay for them to date. (Since, obviously, Selena and I are best friends and I'm such an expert on what a good person she is.) (I'm well aware that the act of attributing good qualities to a person just because he/she is attractive is ridiculous.) (Maybe that's why I don't attribute good qualities to the Beibs? Because I don't find him attractive in the least?) (And now you're all thinking that I'm in love with Selena Gomez. I'm not. But come on- that kid's adorable.) (Now I'm just adding parenthetical statements for the hell of it.) Having said ALL OF THAT- this video made me like him just a little more. Actually, this video makes me like all of them a little more. WAY TO GO, whoever thought this up. Excellent marketing. If it can make ME like BEIBER, it's AMAZING. I get to be around writers. It's just fun. I'll have some PRIME writing time. I'm checking in Thursday and leaving Saturday. That's TWO full nights by myself to write. I mean, it's mind-blowing to think about right now....when I'm lucky to scrape together 30 full minutes to write. The Southern Kentucky Bookfest is the next day- and Rachel Hawkins and Victoria Schwab are gonna be there. I will do my best not to go all fangirl on them.....but I make no promises. I'd never watched or even heard of this show until I started following Kiersten White on Twitter, and kept seeing random references to it. Several months later, we got Netflix....and lo and behold- The Vampire Diaries is on Instant Play. So I thought, "Eh, why not? I'll try it." First off- why didn't anyone tell me Ian Somerhalder was in it? I would've been all over this show MUCH MUCH sooner. I mean, look at him. LOOK AT HIM! And yeah, while he IS beautiful...I also want to clarify that I think he's a really great actor. 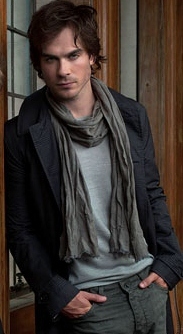 The transformation in his demeanor as he goes back and forth in portraying evil Damon and hopelessly in love Damon, old vampire and new vampire....it impresses me. And the fact that the first few episodes made me HATE him, but at this point I'm like, "WHY is Elena with Steffan?!" impresses me too. Anyway- I've made it through the first season, but I've decided I'm gonna have to slow down....because if not I'm going to finish season two entirely too quickly and then I'll have to wait for season three. And I don't like waiting. Ever. When you start watching TVD. Stick with it past the first few episodes. I wasn't too crazy about it at first! But when in doubt, just mute it and look at Ian. OMG, you are the absolute cutest. You are, like, the OPPOSITE of boring. And OMG I'm obsessed with staying in hotels. Actually, I'm going to a work conference in ST. Louis this summer where we'll stay in dorms, and I'm freaking out just thinking of the QUIET and SOLITUDE. Ahhhhhhh. I loooooooove hotels too. I don't even have to leave town. Just take me to a place with a nice comfy bed, where I don't have to clean up after myself, and where someone will bring food to my door. It's thrilling. GREAT blog!! Always good to see fellow KY bloggers. Kentucky FTW!! Thanks for stopping by. I love meeting other KY bloggers!